I decided to just take it easy tonight instead of thinking about what I need to do and how I can cross more things off my list. So I ended up looking at crocheted lace shawls on ravelry since I have a skein of lace weight from the Sheep and Wool Show I went to last month. Ooo, I found some nice ones. This one grabbed my attention. Something like the sort of thing I was looking for. 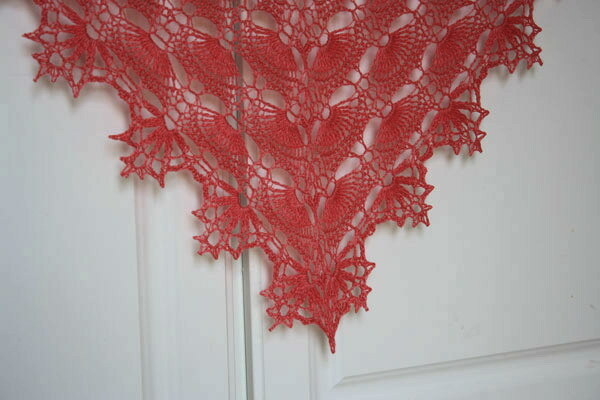 A triangle-shaped shawl, lacy and crocheted. Interesting pattern. 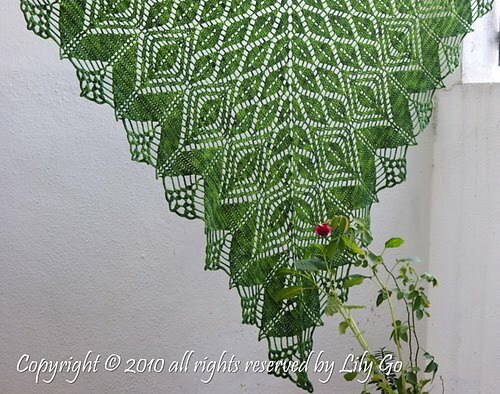 It's Maia Shawl by Lisa Nakrent and published in Crochet Garden. This one I loved instantly. It's called Gathering Leaves by Lily Go. I'm a foliage girl and I'm quite fond of green so this appeals to me quite stongly. But my skein of lace weight is more like the colour above with grey as well. This one here...well, I think I'd just HAVE to do it in green. It's all dreaming at this stage though. I've got plenty on my plate at the moment. I'm moving house next month so organising myself for that. I've been accepted into an aupair program to go to the UK. I've gotta get onto getting my passport as my old one ran out last year. I've also gotta start an online course as a part of the program. So the plan is still to take this skein to the UK and work it there. the red on is my favorite, love it! good luck with all you to-dos! I was an aupair in the US, absolutely loved my host family, I had the tie of my life. I love both of those shawls, beautiful patterns, but I think you're right, the red is very striking. There are KAL for both patterns in Ravelry (maia and my pattern) in "10 Shawl in 2010" forum, in case you want to join in. Thanks you for your comment in my blog, btw.